Even when the little ones think they are too old to take a nap, a rest time is essential... and many days that rest may turn into a nap. Having a nap kit, that holds their blanket, and pillow securely in their own bag, is a great way to make sure their belongings stay together and stay clean. These free patterns will guide you through basic items needed for nap time at daycare, pre-school a babysitter or kindergarten nap time. If you have an embroidery machine, now is an excellent time to use it....to embroider the child's name on everything! Fabric - For this project, we chose one yard of Polar Fleece and one yard of coordinating cotton print. This allows enough fabric for two pillowcases. One and a half yards of cord for the drawstring. One travel pillow—a travel pillow is a small pillow that measures approximately 10" by 14" or 12" by 16 or 18". They can be found anywhere pillow forms are sold and even in many drugstores. Square the fleece fabric, and cut off edges to create squared corners and straight sides on the fabric. This can be done easily with rotary cutting tools. Measure the distance across the narrow side of the pillow. Add one inch to that measurement. On one end of the folded fabric cut a strip of fabric the measurement you obtained plus the inch. Optional: If desired, round off the corners on the larger piece of fleece. Unfold the fabric and finish the edges of the larger piece of fleece with a blanket stitch, a serger or a zigzag stitch. Although this step is not necessary it does give the piece of fabric a finished look and stabilizes the edges of the fabric. Using the fabric folded as it was purchased (matching selvages) Cut one 21' section by the width of the fabric and remove the selvages to square up the piece. 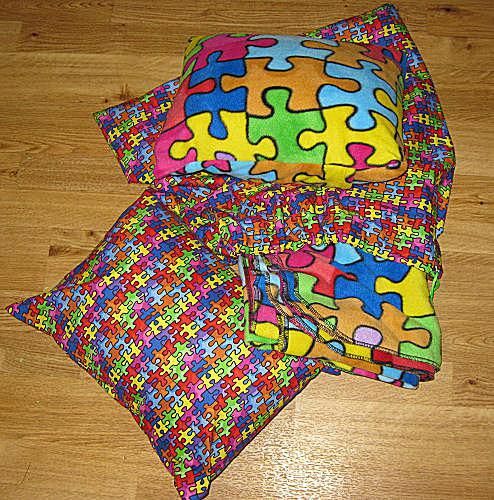 The Remaining fabric can be used as a pillow cover. This pillow cover can be made with the fleece fabric and/or the cotton fabric that is cut and described in Step 2. Using the travel pillow you purchased, measure from seam line to seam line for the width and length of the pillow. The width of the rectangle is the narrower width of the pillow. This measurement will be the width of the pillow plus one inch, which allows for a 1/2" seam allowance on each side of the measurement. The length of the rectangle is the longer measurement of the pillow, times two plus one half of the length of the pillow. For example, if the pillow form is 14" long, you will make the rectangle 14" + 14" plus 7" = 35"
Turn under (bringing wrong sides together) 1/4" on each end of the width of the rectangle. Turn under 1/4" again to enclose the raw edge of the fabric. Sew the hem in place sewing as close to the unattached folded edge of the hem as possible. Find the center of the length of the pillow cover rectangle and mark it on both long edges. Measure 1/2 of the length of the pillow form on each side of the center mark and fold the ends of the rectangle in over the center section, right sides together, aligning the edges. Pin the edges in place. Sew the pinned edges using a 1/2" seam allowance. Turn the pillow cover right sides out and press again, ironing from inside the cover where you can. Put the pillow form inside the cover, and bring the back sections of the cover over the pillow form. Using the fabric as cut in Step 2, fold the width of the fabric in half, right sides together and match the edges. On one seam allowance, measure 3/4" and 1 1/2" below that marking (toward the fold) from the top raw edge of the fabric and mark these measurements. Sew both pinned edges, using a 1/2" seam allowance and leaving the area between the markings un-sewn, back-stitching at the markings. Press the seam open at the un-sewn area and apply a seam finish to the seam allowances in the un-sewn area to the top edge. Top-stitch around the opening in the seam, to sew the seam allowances in place. Apply a seam finish to the remaining seam allowances. Press under 1/4" (wrong side to wrong side) on the top edge of the bag. Press under 1 1/4" on the top edge again, so the seam opening is folded in half. Sew the folded top edge hem in place, sewing as close to the edge as possible. Using a bodkin or safety pin, work the cord through the top casing in the bag. Knot the cording securely and trim off any ends.